Julian Draxler may be granted a move away from Wolfsburg at the end of the season, according to the club’s director of sport Klaus Allofs. The Germany international hit out at the Bundesliga outfit after he was denied a transfer last summer despite publicly stating his desire to leave. 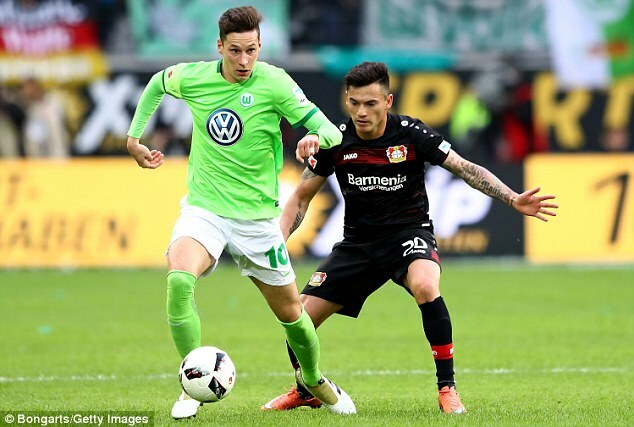 But with Arsenal and Paris Saint-Germain among those interested in Draxler, Allofs admits that Wolfsburg could choose to cash-in on their star man. ‘We’ll evaluate the situation differently, and we may do things differently next time,’ Allofs told German TV channel Sport1. Draxler and Wolfsburg have struggled for form this season, with the club sitting in a disappointing 14th place in the table. However, Allofs believes the ex-Schalke winger is determined to help the club get back on track, making a move in the January transfer window unlikely. Draxler remains keen on a move away from the Volkswagen Arena, but he insists that he will not push for a deal to be done like he did during the previous window. ‘There was a lot of speculation during the summer and some things were true, while others were false,’ he told German magazine Kicker in September. ‘There will likely be more speculation in January, but I will not initiate anything. ‘I am only human and what has happened has not left me unaffected. Football is business, though, and you have to focus on the task at hand. ‘It is not always easy, but I know what’s expected from me. I will work hard to do just that.